The Pentagon conducted a successful test Friday of a missile shield system designed to protect the United States against attack, spokesman Bryan Whitman said. 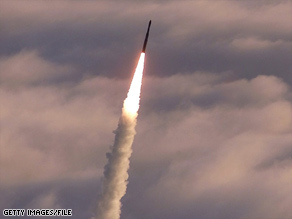 The test involved the interception of a long-range ballistic missile launched from Kodiak, Alaska, with a ground-based interceptor launched from Vandenberg Air Force Base in California. An official said the target missile launched in Friday’s test would have countermeasures. Officials said Thursday that this would be the most realistic of the 13 missile shield system tests conducted to date. So far, the U.S. military has shot down a mock warhead in space with an interceptor missile in seven tests. The interceptor carries a “kill vehicle,” which is designed to destroy the target missile by crashing into it. The Pentagon said this week that in Friday’s test, the target would be a mock warhead accompanied by “countermeasures similar to what Iran or North Korea could deploy,” according to a U.S. Missile Defense Agency official. Critics have long complained that the from tests are not realistic because they don’t involve balloons or other decoys that, they argue, could easily fool the interceptor. The U.S. military conducted a successful test of its system built to knock out long-range missiles that could be fired by North Korea or Iran, the Pentagon said on Friday. The target missile for the test over the Pacific was launched from Kodiak, Alaska and an interceptor was launched from Vandenberg Air Force Base, California, officials said. The intercept took place at 3:29 p.m. EST (2029 GMT). Boeing Co is prime contractor for the system, called the ground-based midcourse defense. You are currently browsing the archives for the Boeing category.